Facing home foreclosure proceedings can be a frightening and disheartening experience. In today’s troubling economic climate and housing market, it has become more common than ever to fall behind on your mortgage payments and run into foreclosure proceedings. Fortunately, you may have options while facing the foreclosure process and options that can help you maintain possession of the home you have worked so hard to obtain. At the Law Office of Kenneth P. Carp, our attorney understands the fears and worries associated with the foreclosure process. With more than 20 years of legal experience, our St. Louis-based firm strives to provide detailed foreclosure guidance to clients in Missouri and Illinois. Whether you wish to fight the impending foreclosure or simply wish to walk away from your home in the best situation possible, our staff strives to offer the detailed advice you need to understand your various options. Contact our office online or call (636) 947-3600 to schedule a free consultation to discuss your specific concerns and learn how we can be of assistance. 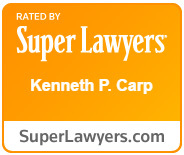 Our lawyer is dedicated to providing personalized support to every client we represent. After all, your home foreclosure concerns are unlike any other. Operating under that philosophy, we conduct a careful examination of your situation and your goals before offering the tailored advice you need to find resolutions. This personalized representation often allows us to find favorable resolutions to even the most challenging foreclosure proceedings. We have been helping clients address foreclosure issues since 1991, and have seen favorable resolutions for all kinds of different situations. This experience gives us the ability to help clients facing even the most daunting financial situations.